We won the Website Award at National Convention! As a member of the AMTA-MA Chapter, I've always been impressed with the progressive, forward-thinking attitude and actions of the leadership. AMTA-MA Chapter has led the way in donations to the Massage Therapy Foundation, hosting extremely high-quality and affordable education for all massage therapists, and creating an extensive list of additional benefits for our members. The mission statement, "We inspire, educate, empower and advocate for the massage therapy community," is illustrative of our desire to be a resource for all massage therapists in our state, and beyond. As a volunteer for several years, and the Online Marketing Manager for nearly two years, I am in awe of the leadership's continuous attitude of embracing new technology and means of communication to inform, welcome, and encourage involvement of massage therapists throughout the state. No chapter, no committee, no website is an island. You, our members, supporters, and friends built this resource. (The amazing talents of the team at SpinWeb are pretty helpful, too.) We are strong because our members tell us what they need, educators tell us about classes happening throughout the state, humanitarians organize volunteers to massage at every imaginable charitable event. The expansive and constructive website is the result of contributions from you. I am honored to serve the AMTA-MA Chapter and I could not be more thrilled to see our combined efforts recognized by AMTA National, selected by a committee of our peers. Below is a more thorough description of what makes our website one of the best in the country. Be proud! We've created something truly worth the many efforts that have gone into its creation. 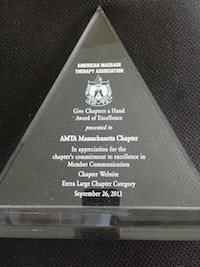 The AMTA Massachusetts Chapter maintains a dynamic, informative and fun website for its members. Each segment of the website contributes to the greater whole, keeping our members engaged and informed. The AMTA-MA Chapter published 27 blog posts in 2012. In Summer 2012, the AMTA-MA Chapter crafted an innovative, first-ever blog series about the upcoming HOD session, specifically in reference to Proposed Position Statements. We began with an informational post, "Why Position Statements Matter." and followed up with one blog post discussing each of the Proposed Position Statements, each written by an elected Delegate. It was a fantastic way to get Delegates increasingly involved in communicating with members, and was well received by our constituents, encouraging further discussion at our September 2012 Chapter meeting. The Delegates ended the series with a thorough wrap-up of all the events and conclusions of the HOD session. The blog also highlighted the AMTA-MA Chapter's updated mission statement. As a further example, a recent post explored the work of an upcoming instructor, and the event sold out within 48 hours of publishing the blog post. Last year's addition of a fun, dynamic and informative blog has proven an invaluable tool for our members. The blog allows us to explore a topic in detail and express thoughts and share resources pertinent to today's practicing massage therapist, and to demonstrate the value of a particular Mass Chapter benefit or event. The News component allow us to get information to members, and have the most current article featured on the home page of our website. In the last year we have published 15 timely news pieces giving our members the most current information about events and happenings relevant to our members. The news section may be found here. The website is the primary venue for featuring Education and Meeting events. Members may view the education schedule, register and pay tuition for education events online. (Payment is also accepted via postal mail, making the process easy and accommodating the varying needs of out members.) Since the creation of the online registration system, education events have sold out and attendance at meetings has risen dramatically. The website includes a venue for featuring Volunteer Opportunities for our members. Organizers may submit, through a quick and easy online form, event and contact information to be listed on the website. This allows for members to take the lead in organizing efforts to bring massage to public events and encourage community amount our members. In an effort to be collaborative and in keeping with our primary goal of service to our members, the AMTA-MA Chapter website also maintains a listing of education events throughout the state and region that may be of interest to our members. Education sponsors may submit, through a quick and easy online form, event and contact information to be listed on the website. Every page of the AMTA-MA Chapter website includes links to the Chapter's Facebook page, LinkedIn group, Twitter stream and YouTube Channel. All of the efforts on social media venues are created with the intent of being useful to members as well as driving traffic back to the website, our hub of communications and a vital resource forum. The website includes a page dedicated to the current newsletter, an archive of newsletters dating back to 2007, and information for advertisers and contributors. The digital format of the newsletters is easy for member to access on their computers or via mobile unit. Every page of the AMTA-MA Chapter website includes a web form so viewers may subscribe to receive email updates, news and resources. Email marketing is CAN-SPAM compliant and lists are maintained to target specific information to a general group, as well as those interested in Sports Massage and Students specifically. Emails to members are sent regularly and include a variety of information and links design to route the reader to the area of the Mass Chapter they will find most useful and interesting. At the AMTA-MA Chapter, we are continuously excited about the new technologies of online communication and website capabilities and the ways it can help us serve our members.